It's no secret that a trade show banner is a key aspect in generating sales. Often, a trade show banner is the first thing that captures the attention of a customer, enticing them to come in and learn more about what it is that you do. But how do you parlay that initial interest into sales? Using your trade show banners and signage to entice customers is only the first step in creating a sale. This article explains some of the ways that you can use your signage as an effective tool to help create sales. Why have a trade show banner? A trade show banner is a sign which signifies your business to people walking by at a trade show. Sure, there's probably a map of the trade show floor, but your banner is probably the sign by which people find and recognize you. A poorly designed sign is easy to walk by; a well designed sign can help existing customers find you, and can make potential customers curious about who you are and what you do. A trade show banner will literally help customers find you. Even a clear trade show map can still be hard to navigate on a populated exhibition hall floor. Banners and signage can be a vital way for your customers to find you and guarantee that they won't get frustrated and keep on moving. 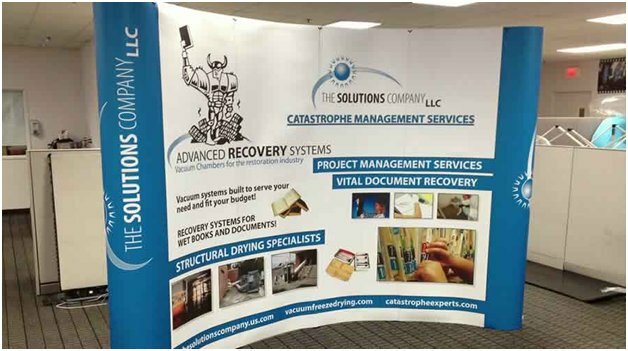 An arresting trade show banner might not just help existing customers find you. It might draw in a totally new clientele. Taking the time to carefully plan out your banner as a marketing material might have the effect of piquing the interest of a totally new demographic at a trade show! Go ahead, project a little bit of who through your trade show banner. Conveying important information such as sales or specials as well as conveying who you are through signage can be a powerful method of helping you connect with potential customers. Trade show banners: the many different types. There isn't just one type of trade show banners. 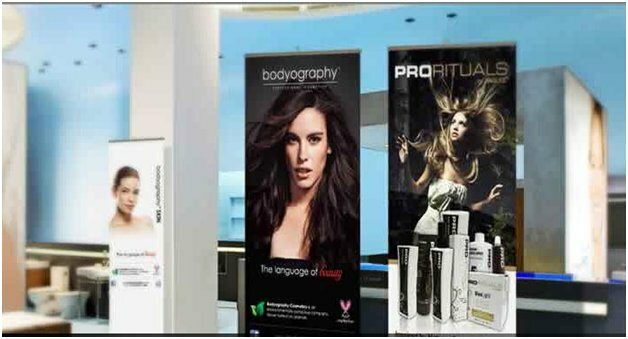 From free-standing Fabsta™ displays to retractable banners, there are numerous options out there. You can view the many available options on the Above All Marketing website. How to translate your trade show banner into sales. Here are some of the ways that you can tailor your signage to create effective signs that draw in customers and make sales happen. Have a clear, simple logo. Make sure that your logo is clear, simple, and easy to recognize. Think of Target's bullseye logo: it is so iconic that it is recognizable even without the business name; the written name only reinforces the logo. 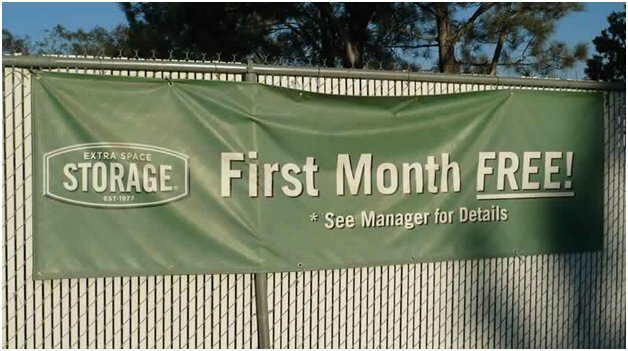 Creating a banner with a visible and if applicable easy to read logo will help customers remember who you are and recognize your business in the future. Familiarity with your business will make it feel like a "safer" company to spend money with. 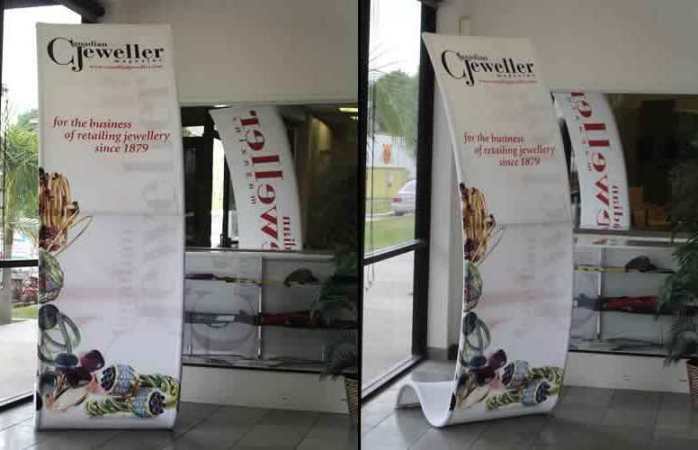 Larger banners, such as a Fabsta™ display or a wall banner, offer space to tell a little of your business's story. Think of restaurants who have a little backstory written on the wall; giving people an insight into who you are and what you do can make them more invested and more willing to spend their money with you. Make it easy to identify what you do. At a trade show, your signage should make it easy for people to figure out what you do. A sign stating "Marvin's Provisions" might not be specific enough, but a sign with your company name and subtext, such as "Marvin's Provisions: custom cakes, catering, and more" might give people a better idea of what it is that you actually do, and help them know from the get go if you might offer a service that they need. Highlight unique aspects of your business. Be sure to offer up any details about your business that might create interest. For instance, if you are a cleaning service that uses all natural and organic products, be sure to mention that in your signage: it is these unique aspects of your business that create interest and can differentiate you from the competition, making someone decide to spend their money with you as opposed to another. Mention any specials or discounts. Are you offering a trade show discount or special? You can print the exact special on the sign or simply reference it as a "trade show special" but be sure to make a note of it on your signage. The appeal of a trade show special can really be an incentive for customers to buy now, rather than at another time. Have signage near advertising materials. Physically, be sure to position advertising materials near your trade show banner. This helps customers who may be interested but not totally willing to commit, allowing them to pick up your materials and perhaps will make a sale at a later point. Clearly mention any special attention you've received. Was your product featured in O Magazine? Be sure to mention this on your signage for even more attention! Feature customer quotes, testimonials, or reviews. Featuring testimonials, quotes, or good reviews can be effective advertising on a trade show banner; this can help people see that you are beloved by your clients and that you are committed to serving them. Only post true reviews, though, and get permission before mentioning any clients by name. Conclusion: These methods might not all seem like a direct line to sales. But small considerations when creating trade show banners can have a huge impact. Taking stock of these tips might just be the difference between a sale and a potential customer moving on! Making sure that your trade show banner is a clear reflection of your business and what it does, presented in a straightforward, easy to read way and effectively displayed, can be the difference between making a sale and having someone walk on by. How has your signage helped you create sales?